The BBC have a good article online looking at opposition to introducing Street View to Google Maps in the UK. Apparently Google started capturing London this week. The main issue is with the UK’s privacy laws where people cannot be photographed without consent if the output is to be used for commercial gain – as is the case with Google Maps. There is also the issue of privacy in terms of houses appearing on the Internet – we did some work for Camden Council a while back and that was removed from the web due to issues with houses being identified in 360 x180 degree photographs. The BBC article is well worth a read, especially for the quotes from the Privacy International Group. 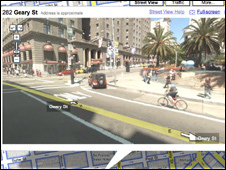 We know Google have done a lot of good for mapping etc and we at digital urban are one of their strongest supporters but recently with their launch of MapMaker some criticism is emerging – see Google Wants to be TeleAtlas at the OpenGeoData Blog. Web 2.0 is all well and good but companies are starting to use Neogeographers and Crowd Sourcing for their own commercial gain. Although of note is the word ‘free’ and the availability of free data, regardless of source, has changed the world of geographical information behind recognition over the last couple of years. Privacy International come across as pompous asses in that article. I agree – why aren’t Privacy International going after the TV companies and the newspapers who show images of people, houses and cars every day without permission? The big objection that Privacy International seems to have made is the showing of faces. Google introduced face blurring in street view a couple of weeks ago but for some reason that isn’t being mentioned in the reporting of this. MapMaker is another issue – Google’s answer seems to be that they make the data free to access and free to use. There is a counter argument that they don’t actually make the map tiles free to access. Ed Parsons is apparently now going to attend the State of the Map Conference so hopefully he and openstreetmap can thrash something out that will please all parties.